This was probably the game where the Champions League slipped away from Saints, yet we really should have won comfortably. 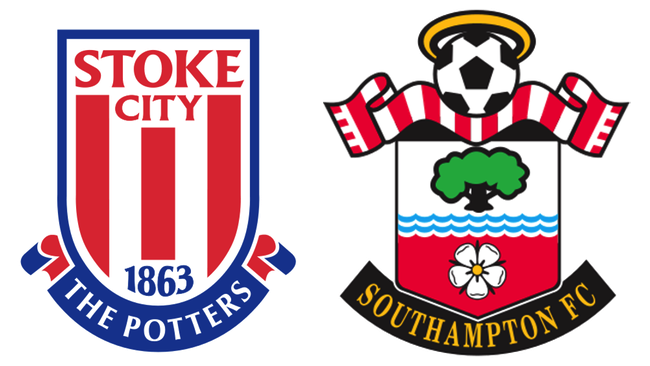 However, going into the game, I was feeling really positive about Saints chances - I had us as winning 2-1 in the IBO Prediction League for heavens sake! The less than even handed refereeing of Mr. Clattenberg was no real excuse. There were still plenty of chances to bury Stoke, apart from Morgan's goal. Mané in particular created two good chances. Firstly providing for Pellè, who could only hit the side netting and then for Tadić whose shot was cleared off the line. Saints were in control from the off, but our usual reluctance to make the most of the chances we had came back to bite us later in the game. I have got used to nothing much coming from set pieces, so was completely caught by surprise when Steven Davis took a corner on the right and whipped in a superb cross. José Fonte leapt at the near post and headed across towards the unguarded bottom left corner. Morgan Schneiderlin made sure, by tapping the ball into the empty net. 0-1 to Saints. The remainder of the first half was controlled by Saints, playing their usual careful build up, only to dither too long in the final third. Stoke started the second half by bringing on Charlie Adam for Ireland and within a couple of minutes they had clawed their way back into the game in fairly bizarre circumstances. Nzonzi's attempted cross looked as if it was going to miss all the Stoke players and balloon over the Saints goal, but at the last second the ball dipped and hit the crossbar, with Davis only reacting at the last second. The ball landed at the feet of Diouf, who just had to tap the ball into the net. 1-1. I can't agree with those that blamed Davis and say that he should have pushed the ball over. A tall keeper, such as Fraser Forster, might have got a hand to it, but we really can't blame Davis for being shorter than his injured colleague. The rest of the second half was very tightly contested, with Saints trying to regain the initiative. From virtually nothing, Sadio Mané beat Begovic to the ball, almost on the edge of where the penalty area meets the byeline and crossed it to an unmarked Tadić. He shot at goal, but it was cleared off the line and the ball came back to Tadić, who shot again, but missed. A great chance gone begging. This was to prove costly, as with barely six minutes left, there was one of those sights we all dread, when the ball pings about the penalty area and not one of the defenders manages to clear it to row zz. The end result was the ball falling to Charlie Adam who wellied it into the back of the net. 2-1. Game over. More troubling than losing the game, it’s was the sight of the stretcher being called for the prostrate Toby Alderweireld, with a shoulder injury. He is such a good player, I just hope we have not seen the last of him. Meanwhile, with Man City and Spurs winning on Sunday, Saints are down to seventh place and are now eight points off fourth place, so the Champions League is almost certainly out of reach now. However, we are only one point off fifth place (on a vastly superior goal difference) and that final guaranteed Europa League spot. The upcoming game at home to Spurs on Saturday lunchtime now looks huge.